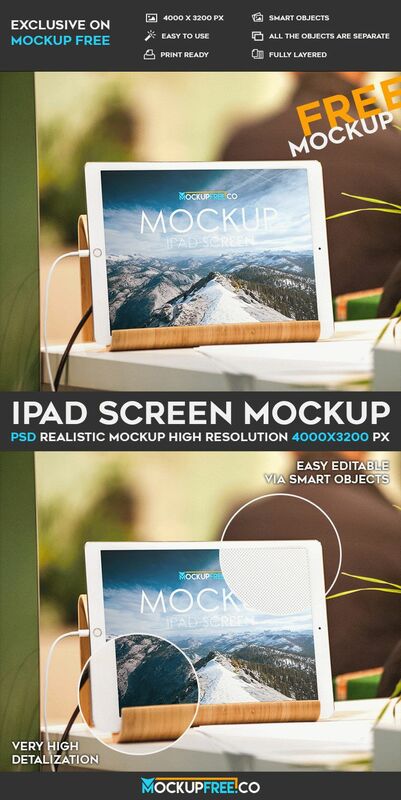 Download our new Freebie – iPad Screen – Free PSD Mockup for your interesting ideas and business promotions. This free PSD mockup from Mockupfree can be useful for creating presentations and adding there the necessary design, for example app design or website design. It is absolutely professional mockup and your wont have any problems with making any customizations in Photoshop. You can see here a very beautiful White iPad screen mockup in the case. The mockup is very bright and attractive. Use it as many times as necessary for your private and commercial needs. If you think that this mockup is necessary for promoting your product, project or business idea – download it and make it perfect the way you wish. We sincerely hope that this awesome free mockup PSD will be useful for you, your company or your clients and bring you lots of positive benefits in future!